Physical copies of this CD are no longer available. However, it is available on iTunes. 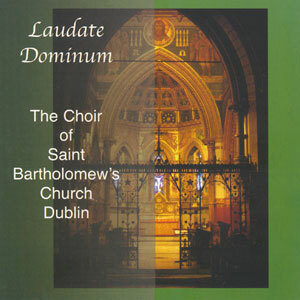 Laudate Dominum was released in early 2006 following a lengthy production process. It was recorded prior to the foundation of the girls’ choir, and thus features the boys and men only. No formal launch took place. Born in Yorkshire in 1883, Sir George Dyson studied at the Royal College of Music under Sir Charles Villiers Stanford, before embarking on a career as music master at a succession of well-known English public schools. He taught at the Royal College of Music before becoming, in 1937, the College’s director, a post he retained until his retirement in 1952. His compositions include a symphony in G major and a violin concerto. His comment “Ours is an age of texture” sums up his compositional style which is well demonstrated in this setting of the canticles for the Anglican Evening Service in D. He died in Winchester in 1964. Maurice Greene (1696-1755) was born in London, the son of a clergyman. He became a choirboy under Jeremiah Clarke at St Paul’s Cathedral where he later became organist. With the death of William Croft in 1727, Greene also became organist at the Chapel Royal, and in 1730 he became Professor of Music at Cambridge University. In 1735 he was appointed Master of the King’s Musick. Many items from his collection Cathedral Music are still used in Anglican services today. Greene wrote a good deal of vocal music, both sacred and secular, including a collection of anthems, of which the best-known is Lord, let me know mine end. Edward Elgar was born, a Roman Catholic, in 1857 at Broadheath, a village near Worcester. His father had a music shop in Worcester and tuned pianos. The young Elgar, therefore, had the great advantage of growing up in a thoroughly practical musical atmosphere. He studied the music available in his father’s shop and taught himself to play a wide variety of instruments. It is a remarkable fact that Elgar was very largely self-taught as a composer. Shortly after Elgar became organist at St. George’s Roman Catholic Church in Worcester in 1885 he composed the trio of works, Pie Jesu, Ave Maria and Ave Maris Stella. These works held such a lasting appeal for him that some twenty years later he orchestrated them, at which time the Pie Jesu was reworked as the Ave Verum Corpus. Elgar died in 1934. Franz Joseph Haydn (1732-1809) composed over 750 works and arranged over 330 songs. Haydn was fortunate to have patrons such as the Hungarian Eszterházy princes which allowed him to compose a vast amount of music over a long career. Haydn died in 1809, after twice dictating his recollections and preparing a catalogue of his works. When the coffin was opened for identification before his reinterment in 1820, the skull was found to be missing. It had been stolen two days after his funeral and subsequently ended up in the Gesellschaft der Musikfreunde in Vienna. It was finally entombed with his remains in 1954 in a mausoleum that had been erected in the Bergkirche at Eisenstadt. The music of the anthem Insanae et vanae curae (‘Foolish and groundless cares assail our minds’) was rescued in 1805 from an earlier oratorio Il ritorno di Tobia (1774-5) that had been shelved due to contractual disputes between Haydn and his then patron. Felix Mendelssohn was born into a wealthy, cultured family in 1809. Mendelssohn was a child prodigy and made his first public appearance as a pianist when he was only nine. Mendelssohn’s significance lies in the unusual quantity of good music he wrote in relatively few years – he died in 1847 at the age of 38. He wrote his finest music before he was eighteen and among his later works only his chamber music fulfills his early promise. Mendelssohn wrote a number of works for possible church use, both Protestant and Catholic. Ernest Lough became a chorister of the Temple Church, London in 1923. “I remember having to read an extract from a murder trial in the News of the World. Doctor [George Thalben-Ball] accepted me with a warning: ‘You’re getting a bit old,’ he said, ‘you had better hurry up.’ I was only twelve years old!” Dubbed ‘the most famous choirboy in the world’, Lough was responsible for bringing the anthem Hear My Prayer to a wider public with his great recording of 1927, when the technology involved recording directly onto a disk of hot wax. Samuel Sebastian Wesley was born in London in 1810, the illegitimate son of the composer Samuel Wesley and grandson of the hymn writer Charles Wesley. He was organist of the cathedrals of Hereford (where he eloped with the Dean’s daughter), Exeter, Winchester and Gloucester and of Leeds Parish Church. He declared that “My published 12 Anthems is my most important work.” His other works include Thou wilt keep him in perfect peace. Many of the difficulties he encountered in a turbulent career reflected the circumstances under which church musicians were forced to work. “This state of things,” he once said “is the natural result of such an anomaly as that of one professional calling being wholly supervised by another – viz, Musicians by Clergymen.” His struggle to improve matters became a lifelong crusade whose fruits were only beginning to appear when he died in 1876. Baptised Johannes Chrysostomus Wolfgangus Theophilus (after the Saint’s day on which he was born) Mozart was appointed Konzertmeister to the Archbishop of Salzburg in 1772 and during this period wrote many of his sacred works. In 1779, unable to find a court position in Europe, he returned to Salzburg where he was appointed court organist to the Archbishop. It was there in 1780 that his Vesperae solennes de Confessore KV 339, from which Laudate Dominum comes, was written. Two years later Mozart resigned from his position due to increasing tension and disagreements with the Archbishop. Two hymns complete this collection. All for Jesus! with words by W.J. Sparrow-Simpson is taken from the oratorio The Crucifixion by Sir John Stainer (1840-1901). “Musicians today,” wrote composer Ernest Walker in 1924, “have no use for The Crucifixion.” Stainer himself, late in life, condemned his composition as “rubbish”. Yet both he and Walker must have known that these judgements were neither fair nor true. Following its 1887 première, it was given more performances than any choral work except Handel’s Messiah, and Mendelssohn’s Elijah and St Paul. The chorus God so loved the World enjoys an independent existence as an anthem. The second hymn, O blest creator of the light, is the Office Hymn for Sundays between Trinity Sunday and the beginning of Advent. The Office (or Vesper) Hymn is traditionally sung before the Magnificat at Evensong. The words were most probably written by Pope St Gregory the Great (560-604) and were translated from the Latin in 1851 by John Mason Neale. The tune is a Mode VIII plainsong melody, Lucis Creator, which dates from the 8th century or earlier and is taken from the Sarum Antiphoner – more correctly the Antiphonale Sarisburiense – a thirteenth century manuscript from Salisbury Cathedral in England.